Please welcome my real life friend, La Turka, to the Green Phone Booth. I first met La Turka through my green book club. 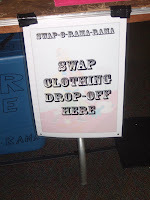 We've watched eco-movies together, gathered goods for the local shelter network, and swapped snacks. 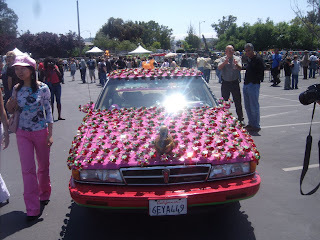 When I heard that she was going to Maker Faire - the ultimate REUSE and DIY green event in the San Francisco Bay Area, I begged her to report back in and asked for plenty of pictures. She has very nicely obliged! 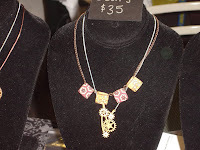 (To read more about the Maker Faire, check out yesterday's guest post by another real life friend of mine, Jess). 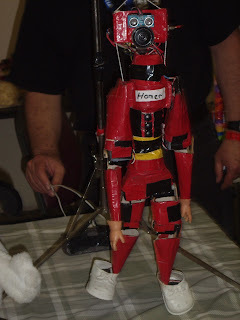 When Green Bean asked me to write about my experience at the Maker Faire I was worried I would not have much to say. What could I possibly contribute to the blogsphere? That was before I actually went to the Maker Faire. It was amazing. 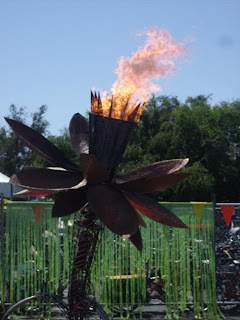 The Faire was alive with handmade robots, steel structures on fire, and beautiful hand-made crafts. 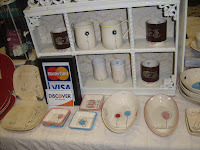 I had entered a world of cool sustainable creations – mostly handmade, all self-created and designed. 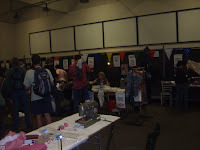 Initially I came to the Maker Faire to investigate the swap-o-rama – a wonderful clothes swap that involved donating a bag of clothes you no longer need, picking up clothes donated by others you could use, and altering them into your own creations (using sewing machines, stencil art, etc.) 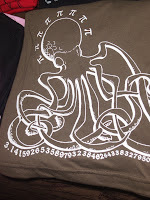 in many various ways to create reused, DIY designed clothes. 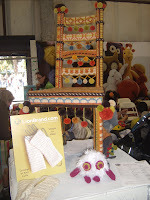 and a knitting area complete with workshops which reminded me of a knit street art tag crew, "knitta please". 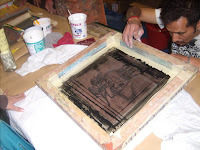 I was awed by the Patchwerk Press group, a collectively owned screen printing shop run out of Oakland and San Francisco. 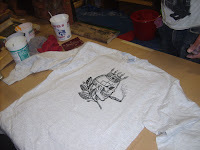 They brought loads of handmade screen-print designs to be painted onto reused clothes picked out by the swap-o-rama crowd. 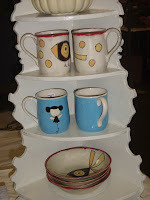 hip and bright ceramics made by Ezme Designs. 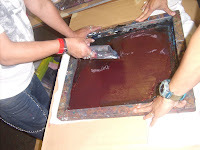 Recover Your Thoughts also sold reconstructed journals made out of old library books and reconstituted paper. 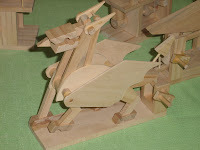 and wait… before I forget, did I mention the do-it-yourself robots and movable wood toys by Mechanical Marvels? No!? They are cool enough to made a mother of girly-girls want to put them in engineering classes. 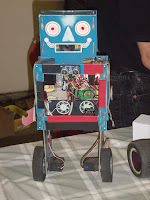 (The HomeBrew Robotics Club provided many of the robots and meets once a month. Now, where were we? 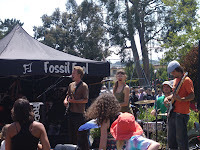 Oh yes, then just when I thought I was worn out and ready to go home I wandered into the Homegrown Village tent, full of helpful information regarding sustainable, green living and healthy choices. 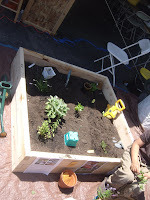 I encountered information on urban gardening, handouts on how to grow your own vegetable garden in the Bay Area by the Division of Agricultural Sciences at the University of California (I don’t have the link, but Ecology Center also has some great info for the Bay Area), and demonstrative garden boxes that shows and explains how to create a family garden patch. 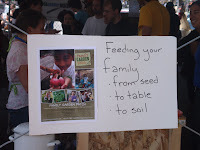 Although the website for the Family Garden Patch is still developing it made me think of the East Bay “food justice” movement to provide affordable healthy food for all people at the People’s Grocery. I was also given free handouts which provide information about keeping families healthy, and the Smart Seafood Guide and on finding and drinking safe water from the tap and ditching the water bottles. I have to say we all come with preconceived ideas of what experiences will be like, and I had my own suspicions that I would find a prettily packaged “green” faire that had little to do with social justice or providing sustainable living options for all people. 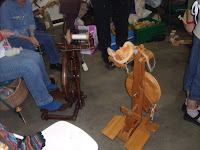 But, I was happy to find a focus at the Maker Faire on sustainable issues of health and access to a better quality of living for all people, and not just an over focus on “greening” being tied to high-end products that many people can’t access or afford. 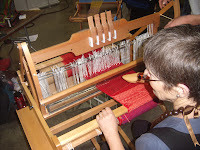 Many of the sustainable items being displayed and spoken of at the Faire were not products, but instead fabulous ideas and/or age-old systems of providing simple and slow foods, reusing what we have, and using less of what we need (and of course creating beautiful designs). I was impressed for sure, and even inspired to create some kind of movement of my own (not sure how yet, but a girl can dream). Speaking of inspiration, did you know that Yahoo has a call out for new green inventions at Make It Green? The results of which are the GreenBox pizza box (use the pizza box to store pizza and then break into plates to eat from), and “dryer balls” that cut down on energy used just simply by adding them to your dryer? Did you know that Instructables.com has hundreds (or more) instructions available on everything from cake baking to robot building? It’s all pretty darn impressive. Exhausted, but happy, 5 hours later, I had still only seen a small fraction of the Faire. Next year I will go every possible day (and bring my whole family, my husband is incredibly jealous I went and he didn't after reading this post). 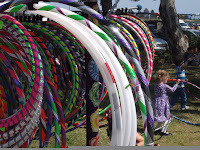 As I was leaving I happened upon a hula-hoop area with adults and children spinning about – skirts twirling in the air and children giggling. 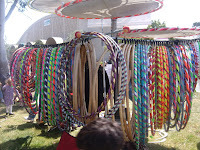 Simple fun is always just a hula-hoop away (although I still want to build my own robot). Wow - this recap is so amazing. Now I want to go to this Faire myself one year - nevermind that I live 3000 miles away (wouldn't be very sustainable of me, would it?!). Such an amazing array of crafty options. Thanks for giving us your window into the event. Thank you! 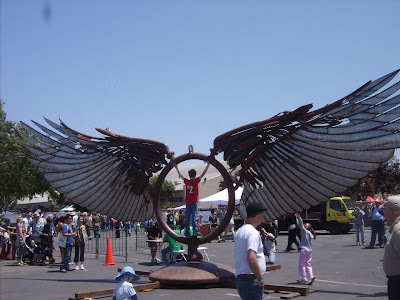 I had never heard of the Maker Faire before this year. I know it does travel - it has been in Austin, Tx and the UK before (!). 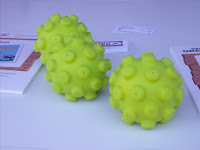 I did not have time to make mine so I bought Wool dryer balls from www.WoolDryerBalls.com and LOVE THEM! They really do work for all our laundry. Even my cloth diapers got done drying in less than 60 min with the wool dryer balls when normal without it takes over 90 min- and everything came out softer. Thanks, La Turka, for an amazing summary. Great summary. 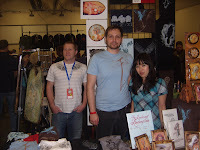 I went to Maker Faire too but only saw half of the stuff you mentioned. So much to see, so little time. Wow, I am so jealous. We have nothing like that in our area. It all sounds very cool indeed. 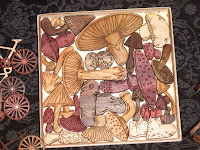 I loved the pictures. Thanks for posting!